Maybach 62 fuel consumption, miles per gallon or litres – km. 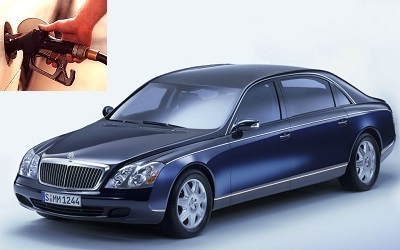 Find out how much fuel consumed litres/ km or miles per gallon a Maybach 62. From year: 2002, 2003, 2004, 2005, 2006, 2007, 2008, 2009, 2010, 2011, 2012, 2013. How much fuel consumed Maybach 62 engine 5.5 l, liters / 100 km or miles per gallon. Maybach 62 it is a large / luxury car. Car max power: 551.00 PS (402,98 kW or 540,29 HP) at 5250 Rev. per min. Car fuel with mixed drive: 15.9 litres/100 km (14,75 miles per gallon). How much fuel consumed Maybach 62 engine 6.0 l, liters / 100 km or miles per gallon. Car engine capacity: 5978 ccm (362,96 cubic inches). Car fuel with mixed drive: 16.3 litres/100 km (14,36 miles per gallon).